From 9:30 to 17:30, followed by a festive cocktail. Please register for the event before Friday May 3rd 2019 by filling out the registration form below. 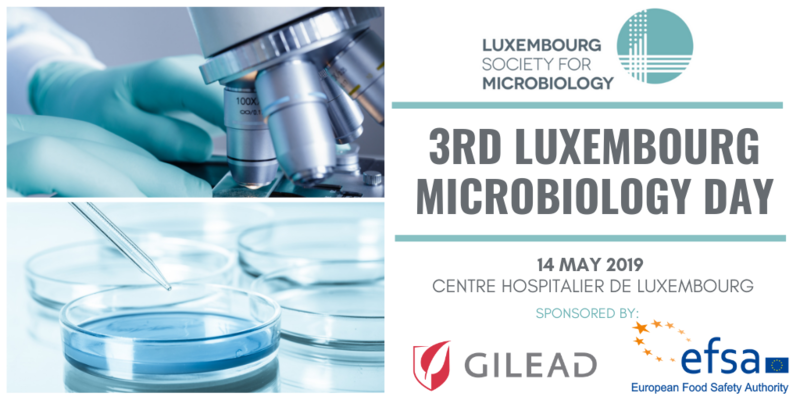 The participation to the Luxembourg Microbiology Day and the LSfM General Assembly is free of charge for 2019 LSfM members. Non-members are invited to attend all events and will be charged a registration fee of 30€ (15€ for students). The registration fee includes a full individual (professional or student) membership for 2019. Registration is complete once the participant has registered on our website (http://microbiology.lu/plans/register/) or via e-mail to secretary@microbiology.lu and the membership fee has been paid (bank information: BCEELULL LU31 0019 4855 1745 9000; payment at the registration desk of LMD2019 also possible). The deadline for abstract submission for student and post-doc presentations is April 24th 2019. A selection committee will communicate the accepted oral presentations by April 30th 2019.